North Carolina State’s Marc Hoit and Eric Sills spearheaded adoption of cloud and virtualization technologies to simplify IT support and reduce costs. North Carolina State and other universities take advantage of IaaS environments to improve customer service, increase IT efficiencies and, in some cases, cut costs. North Carolina State University's Virtual Computing Lab (VCL) has many uses. Virtual desktops allow students to access the educational software they need without ever having to step foot in a computer lab, while researchers use the same infrastructure for high-performance computing. For the lab's IT staff, the private infrastructure-as-a-service (IaaS) cloud simplifies IT support and reduces costs by allowing the university to consolidate computer labs. Moving forward, IT plans to use the VCL for disaster recovery and hopes to integrate it with other universities to share server resources. "Our virtual computing system keeps evolving. 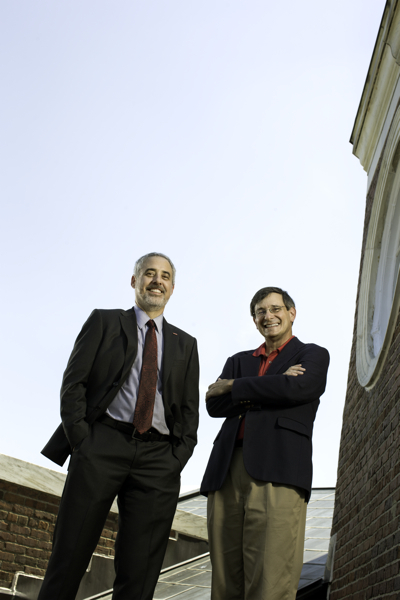 There is a lot we can do with it," says Marc Hoit, NC State's vice chancellor for information technology and CIO. "It gives us the nimbleness, flexibility and efficiency that everyone is looking for." IaaS can prove a savior to colleges and universities with limited IT budgets, small IT staffs or packed data centers with no room for expansion. Through virtualization, institutions can consolidate their data centers and build their own private cloud, or they can outsource their server, storage and network connectivity needs through public and community clouds. IaaS can also provide a cost-effective method for backup and disaster recovery. Using IaaS to deploy virtual desktop infrastructure (VDI) is becoming more popular. As distance learning programs grow, and students and staffers increasingly flood campuses with myriad mobile devices, providing access to applications and computer resources anytime, anywhere is fast becoming a must-have technology resource. Launched in 2004, NC State's virtual lab today uses 2,000 IBM blade servers, VMware, open-source KVM virtualization software and storage hardware from EMC, IBM and NetApp. To build the lab, NC State developed cloud software that has three key components: a web application, featuring a web interface and scheduler that allows users to reserve computer time and self-provision services; a database; and a management node that serves as the brains of the operation, says Eric Sills, NC State's executive director of shared services. Through the web interface, students can launch a virtual computer with the applications they need on their own desktop computer, notebook or tablet. Others can spin up virtual servers for testing and development. "If they mess up, they can delete the image, reload a fresh image and start over," Sills says. Researchers use the same web interface to provision a cluster of physical servers for high-performance computing, which allows them to run large-scale data analyses and rapid simulations. The VCL has simplified and reduced the amount of time it takes to manage computer resources and has allowed the university to eliminate half the computer lab seats on campus, which saves money, Hoit says. NC State is sharing its VCL technology in multiple ways. In late 2008, the university donated its VCL software code to the nonprofit Apache Software Foundation. Now, other universities and organizations can build their own environments with the Apache VCL software. Because the lab can scale and has plenty of server resources, the university has turned its environment into a community cloud, allowing students at a dozen North Carolina community colleges and the University of North Carolina's Greensboro and Pembroke campuses to use its services, Sills says. IT also plans to use the VCL for disaster recovery of critical university applications, such as enterprise resource planning. If the main data center running the ERP system goes down, virtual machines can relaunch the software anywhere. Unique users made 224,962 reservations to use NC State's Virtual Computing Lab in 2011. During that time, 120 research projects used 12.4 million CPU hours for high-performance computing. "Our university is not wealthy enough to have $5 million worth of equipment and a second copy of the ERP system at a secondary data center," Hoit says. "But with virtualization, we can restart an instance on the VCL in 20 minutes." Across the country, California's Claremont McKenna College is taking advantage of NC State's VCL technology. The college built its lab in 2011 as part of a larger data center overhaul. At the time, the college's servers were aging and the IT department had just started to virtualize servers, so it was an opportunity to rethink the data center and future-proof it, says Jeremy Whaley, director of information systems and network services. "We looked to build a private cloud on campus so that we can align ourselves with other cloud offerings off campus, primarily for disaster recovery. Eventually, we could host a large number of services outside of our campus data center," he says. The college built a private cloud using Vblock technology by VCE, a joint venture by Cisco and EMC with investments from VMware and Intel. Together, the tech companies built an integrated cloud infrastructure system that includes Cisco UCS blade servers, EMC storage, VMware software and Cisco switches. Whaley purchased two blade chassis loaded with four blade servers each and a 14-terabyte storage area network. By virtualizing the environment, IT consolidated 100 physical servers down to eight. IT used part of the data center to deploy a VCL for the W.M. Keck Science Department (shared by three sister colleges: Claremont McKenna, Pitzer College and Scripps College). The Vblock cloud runs Apache VCL's web interface, database and management software on three virtual machines, which connect to two physical servers that host students' virtual desktops. Because the college purchased hardware and software to build the private cloud, it hasn't seen cost savings. But it benefits by providing students access to applications over the web. "In a world where we are trying to cope with the consumerization of IT and provide anytime, anywhere access from any device, this allows us to meet our users where they are," Whaley says. Start small. Build a virtual computing lab incrementally. Begin with one application or a small set of applications. Find friendly users who won't be too harsh if it doesn't work right out of the box. You just need a small amount of hardware to deploy the Apache VCL cloud software. Grow the system as demand grows, says Eric Sills, North Carolina State University's executive director of shared services. Join the Apache community. During implementation, be active in the user group forum, which is good at answering questions, Sills says. Train students. Some students may have difficulty understanding that they're logging in to a virtual computer that runs inside their computing device. A professor's first assignment should be for students to simply log in, launch a virtual machine and save a file. "That solves any connection issues before any real assignments are due," says Jeremy Whaley, Claremont McKenna College's director of information systems and network services.